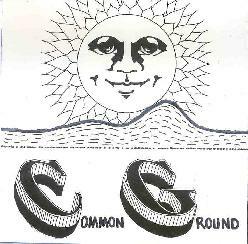 Common Ground - "s/t" / The Common Ground of Franks, Malgeri and Pauciello - "Vortex" / The Common Ground of Franks, Malgeri and Pauciello - "Esoteric Portal" " / SIXDEE - "Six To Nine"
On the self-titled Common Ground CDR, the band consists of Raymond Franks on drums, Sal Pauciello bass, Joe Malgeri on guitar and Rob David on keyboards. The set opens with "Warp Six", an excellent dirty Bluesy psych-rock instrumental. It begins with a stoned Alice Cooper "I'm Eighteen" vibe. But over the course of this 12 minute jam Malgeri's guitar goes seriously into space, while David's keys inject a freaky fusion edge into the music and Franks and Pauciello hold down a steady measured groove. It's raw stuff but mightily enjoyable if you just sail along with it. "Reggae Heat Wave" is a quirky jazzy piece, but by no means lacking in raw rockin jamming. Like Booker T on acid at the CBGB's. "August Virgo" is similar but more overtly jazzy. Common Ground also do a fiery cover of John McLaughlin's "Marbles". I really dig the power trio thrash combined with David's pulsating organ. A total rockin freakout track. "Sad And Lonely" is a very cool proggy psych-rock jam that mostly floats along in a mind-melting dream state but has it's moments of fiery rock. "Cantos De Los Flores" is a bouncy Santana cover that Common Ground clearly make their own. And the 28 minute "Kitchen Sink Blues" is the epic jam of the set. This sucker is candy apple coated with ripping BLUES rock. It standard... it's acidic... it's jamming... nothing new here... but it feels soooooooo good!!! I'm really growing to love Joe Malgeri's guitar playing. This guy has genuine fire and passion. Some of the best guitarists are raw and dirty... but oh so expressive. That's the case with this dude indeed. And on it goes for 28 bong blazing minutes... and not a single dull moment for the fan of 60's/70's heavy Blues-ripping psych-rock. Gimme another beer will ya? Even though the Vortex tape is titled The Common Ground of Franks, Malgeri and Pauciello, it's actually another quartet set, this time with both (or alternatively) Rob David and Oscar Marin on keyboards. The opening "Prelude" indicates this may be a more experimental free-improv affair. Very avant-ethno percussion heavy. "August Virgo" is he same track as heard on the self-titled Common Ground CDR, but this time around I'm struck by a more Snakefinger jazz styled sound. Great groove!! "Always Another Rainy Day Ahead" is similar, with a cool boppin' soulful 60's sound. "Voodoo Chile" is a deep-in-the-gutter brain blistering take on the Hendrix classic. 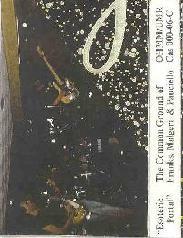 Common Ground also cover two Santana songs: "Cantos De Los Flores" (also on the CDR) and "Moonflower", and Tito Puente's "Oye Como Va" (which we all know is really another Santana cover ;-) ). These guys do an impressive job with the Santana thing and I just love those rockin psychedelic Latin flavors. And remember how the earlier Camel albums had incorporated Latin sounds into their brand of progressive rock? I hear a lot of that from Common Ground too. Luscious traces of Nektar pervade throughout as well. I mostly gave up trying to keep track of song titles - it's sometimes harder to distinguish tracks with cassettes - but it doesn't matter because Common Ground is music you can just sit back and groove along to. A lot of it sounds like 70's jamming progressive/psychedelic/krautrock, with tasty head massaging guitar melodies and wonderful old time keyboard sounds, some of which have that ultra cool high pitched 60's flair. But there are oodles of stratospheric jams and if you told me this was the latest reissue on the Garden of Delights label of an early 70's German band I'd believe it. There's one tune near the end of side one, I guess it's "Vortex", that's a quirky electro cosmic ditty that reminds me of Neu! Side 2 has some more spaced out electronic driven journeys that I really liked... one of them very much in the freaked out Space Ritual mold. And after all that the album wraps up with a bouncy Polka guaranteed to put a smile on your face and send you running to the nearest Perogi stand. In addition to "Warp Six" and "New Reggae Heat", which are both on the CDR, we've got lots of scrumptious tunage on the Esoteric Portal tape. With the exception of two tracks, this one is just the trio of Franks, Malgeri and Pauciello. The band come roaring out of the gate on the killer jamming "Portal". Honestly, Malgeri's guitar is a psych-rock fans dream. And Franks and Pauciello are far more than mere keepers of the beat. Once again, this is raw stuff, with an edge that's firmly in the garage, and sometimes even fairly standard in terms of Blues-rock. But at the same time there's a progressive rock sensibility to the music which finds us transitioning through multiple well thought out and intricate themes. Common Ground reveal more of their love for Hendrix with a cover of "Third Stone From The Sun". The aptly titled "Magic Boogie" is one of the band's heavier tunes, reminding me a bit at times of Uriah Heep, and featuring loads of Common Ground's trademark jamming and ripping trip-rock guitar. "Bela" features more of that hail-to-the-70's prog/psych/krautrock sound that Common Ground do so well. And what a monster this one is. Set your time machine for 1971 and experience a cosmic slab of psychedelic heavy prog mana! And finally, "Three Of Water" is a fun jazzy psychy hip-shakin tune that sounds like the soundtrack to a Beat club scene in some 60's flick. 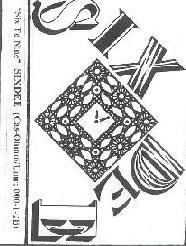 The music on the SIXDEE cassette is certainly similar to Common Ground, though it travels more in a Bluesy, but still psychedelic, grooving style. The band lineup is a little different too. In addition to Franks, Pauciello and David, we have Ron Davis and Bro. Mike X, both on guitar. The tape opens with Sad & Lonely, which we heard on the Common Ground CDR. I guess this is a different version. Anyway, SIXDEE go on to do a bouncy, 60's funk dancey, 11 minute cover of the Beatles' "Day Tripper". Other than the basic melody of the song, SIXDEE make it their own, with the guitars jamming along in a funky wah'd psychedelic fashion. The sound isn't so hot on this cut, or most of the tape for that matter, maybe it's live, so you have to listen closely to hear all the cool guitar work. "Hell Toupee" is also the title track of the Wiretap CD (see AI #22), though this is a different version of the song. I didn't revisit the Wiretap version, but my description of it being a Bluesy jamming instrumental with tasty guitar applies here as well, though I don't hear what I described then as bits of the Grateful Dead and hints of Zappa. This is very similar in style to "Day Tripper", where the band locks into a single theme and just jams along, and of course we've got David's killer organ sounds to augment the guitars. In fact, I'm wondering if this is a rehearsal track because I keep hearing the musicians talking amongst themselves, at least that's what it sounds like. 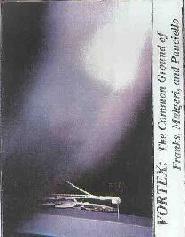 Side B of the tape consists of the brief "Watch Out For That Space Debris" and the lengthy "Sixdee Funk", which does indeed include heaping helpings of funk, along with the same exploratory jamming style heard on the rest of the tape. But the bass is pounding in my head at the expense of the organ and guitars??? Overall there's some very nice playing on this tape, and I dig the style, but I'm not hearing them veer from their course much. It's not nearly as strong or varied as the Common Ground recordings. The poorer quality sound and mix may well be in large part to blame, but despite the abundance of good playing and ideas, the music is far less exciting and adventurous than Common Ground. For more information you can email Owl Head Man Music at: SRPau@msn.com.